If you have the time, ask students to find images to add to a project photo album for everyone to use. Be sure to remind them about copyright rules and the need to cite the original source. Pro Tip: you can add a comment to a photo which includes a citation and link to the original source. Document learning and the development of a project by taking photos at the beginning, middle, and end of the assignment. Use the animation feature of Google Photos to create a time lapse of the project, showing how it evolved and changed over time. Here's an example of some books that I have read this year. 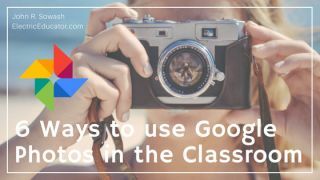 Once you have a collection of classroom photos you can use facial recognition to find all of the photos of an individual student, place them in an album, and send them to their parent to show what they have been doing in class. Sharing pictures is a great positive connection you can make with parents.Note: make sure that you follow your school's policies on taking photos of students. Most schools have a media release that parents sign at the beginning of the school year, giving permission for their student to appear in classroom photos.